Now I didn’t love everything about it, and I’ll be a little more in depth, but on the whole, the new season delivered. And that’s hard to do. Fans have been waiting for this for, I believe the figure is, seven years. Also, and I’m just gonna mention this and move on with my life, there’s been a fair amount of “hating” on the new format, aka the Netflix release, but none of the studios would pick it up, so I say party on, Netflix. Especially considering that it’s being made by all the same people, cast and crew. It’s a little different, it may take some adjustment, but the future has arrived, let’s give it a fair shake. I’ll get the negative stuff out of the way, cause there was really only one very major (and it is pretty frakking major) thing that I didn’t like about Season 4: Michael. As I’ve mentioned before, Michael is my favorite character in Arrested Development. And he’s the only thing that kept the family going as long as it did. In the end of season 3 he says, screw it, they have to take care of themselves for awhile, but the character who has fallen from grace the most is him. Bittersweet and ironic? Sure. But his character also got annoying. Maybe the rest of the family finally rubbed off. The fact that he was living in George Michael’s college dorm room pissed me off more than I can really understand, and was uncalled for even in the rules of their universe, but it did send him back to the model home, an important plot point. Although, George Michaels’s Dad, crossed out and changed to Michael, note, was personally, my biggest, “awww, how sad,” moment of the season (if you’ve seen it, you know what I’m talking about). His stuff with Isla Fisher was cute, but Michael’s character has fundamentally changed and I want the old Michael back, if there’s any way to swing that. Also, more Maeby please. She was another favorite of mine and she only got one episode, and rarely crossed over into the other character’s episodes. Hers was one of my fav’s this season for sure. Possibly even my most favorite. And that’s really the most important thing. Although the bastards ended the season on a cliffhanger and I can’t wait another seven years to find out what happens next!!!! 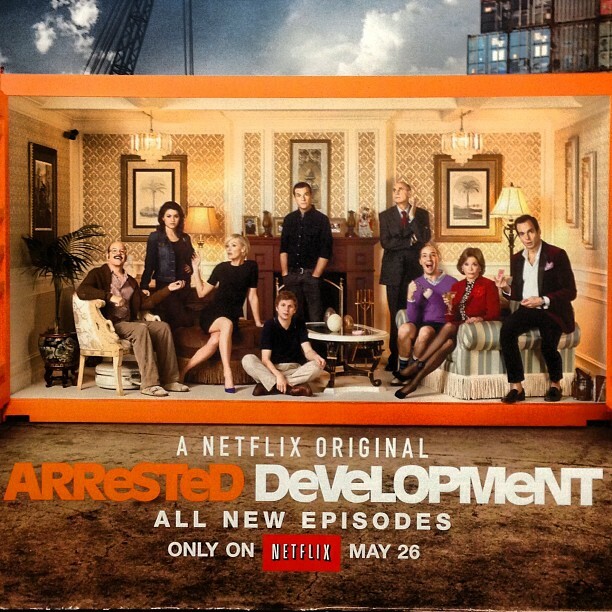 This entry was posted in tv and tagged arrested development, bluth, jason bateman, netflix, ron howard, season 4. Bookmark the permalink.